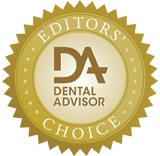 Make sure the band is level with the occlusal table – wedge well for less flash. Make sure the band is centered over the contact point before placing the wedge and ring. Take the time to carefully place ring over the teeth so that you get ideal adaptation of the band to the buccal and lingual surfaces of the teeth. Place the wedge after the ring is on. 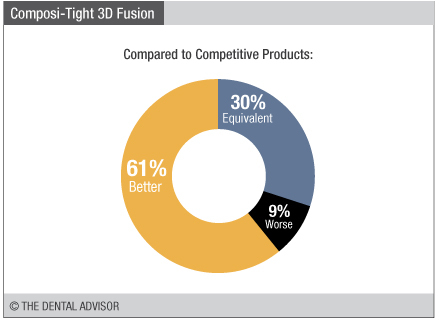 Composi-Tight 3D Fusion was evaluated by 23 consultants, with a total of 605 uses. 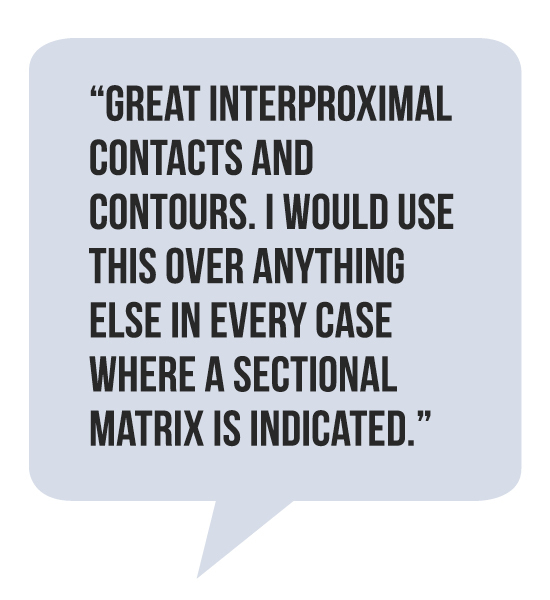 Excellent interproximal contacts and contours. Includes wide rings and rings with subgingival extensions. 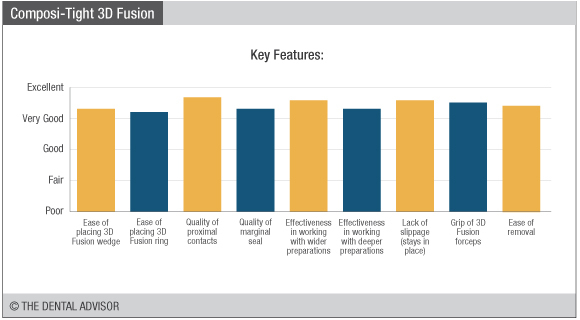 Placement of Class II composite restorations. Retention extensions on rings to prevent slippage. Wide ring available for wider preparations. Coated and tabbed matrix bands. 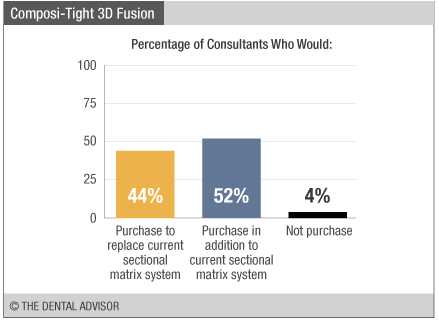 Composi-Tight 3D Fusion is a next-generation sectional matrix designed to enable the creation of tight contacts in posterior composite restorations. The strong rings improve retention and fit to the tooth, with retention extensions anchoring the ring to the tooth to prevent slippage and silicone tips that minimize and prevent flash. A wide ring is included for wider preps. The matrix bands have tabs to make placement easier and are coated to be non-sticky for easy removal. 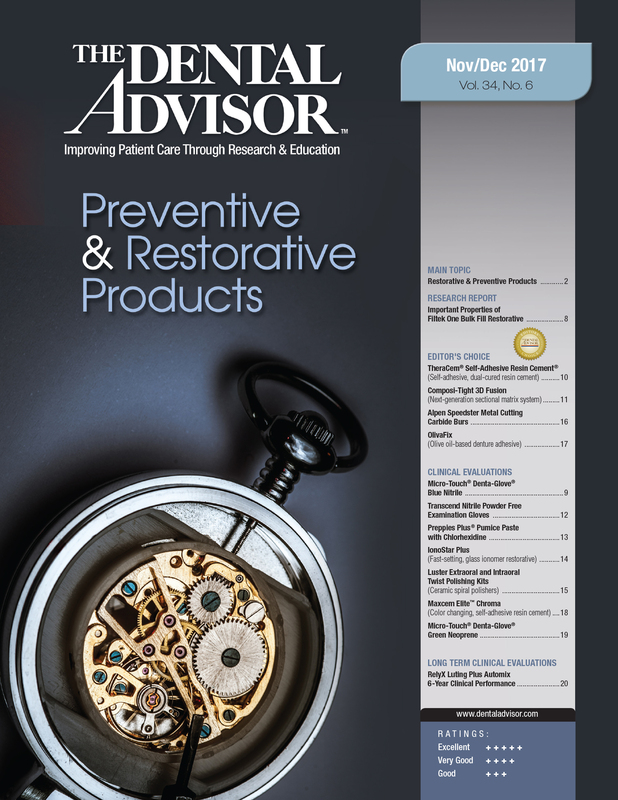 Two of the three matrix bands have sub-gingival extensions. The 3D Fusion wedges incorporate fins that retract during placement then spring back to help secure it tightly against the tooth for good marginal seal. The FenderWedge wedges included can be used to pre-separate the teeth during preparation for conservative preparation. 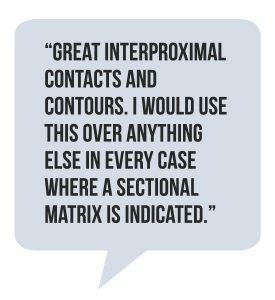 Composi-Tight 3D Fusion is available as a comprehensive kit that includes two each of the short, tall and wide prep rings, 70 assorted full curve matrices, 80 assorted wedges, 12 assorted FenderWedges, and one pair of forceps. 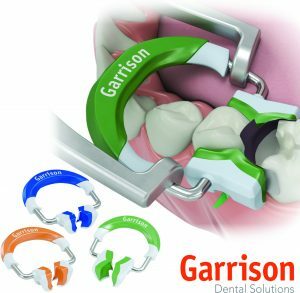 In addition, a Composi-Tight 3D Fusion Ring refill kit is available with one each of the short, tall and wide prep rings. Ring kits are also available as refills containing two rings of one size only.